I just got back from taking Chesty to Downtown Dogs for boarding while we’re gone this weekend. We’re heading south to Ft. Lauderdale tomorrow morning for my niece’s graduation party and we’ll be home Sunday. He’s adjusting well to boarding so I don’t feel so bad about leaving him. 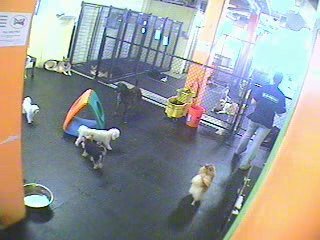 Today there was another little white dog that you can also see in the webcam photo but Chesty is the one in front facing away from the camera. I spoke to Michael from Circle Lord today and my swirls template should be shipped Friday. I’m anxious to get it and try it out as the quilts I’ve seen look wonderful. Mine will be the smaller version since I have a Gammill Premier. Now I just have to wait a decent amount of time before ordering the zig zag template used to quilt this one. Maybe I can convince Keith I need this one too in another 3-6 months (keep in mind I only do quilting for family and charity). Speaking of quilting I have a small table quilt to load and start and a binding to put on before I leave so I better get to work. Just to give Debbie a hard time – can you believe that she’s not planning to drive over from the SW side of the state to see me while I’m in Ft. Lauderdale. Don’t ask how many times I drove to see her when I was living in Florida and Georgia and they were cruising on their boat! Enjoy your trip! Chesty is lucky he gets on well with other dogs. Our Leo seems too aggressive, but that is our fault for not socialising him enough.I love all your wonderful quilts. What a great little play area. Your little furbaby is a doll! Ah, yes, but you’ve forced Debbie into blogging now, and she’s much to busy with that to come visit you! LOL! Have a good trip! I know, I know!! But I’m teaching the rest of this week, and then there are those 10 quilts I have left to do before the end of the month. Have to work to make up for playtime at MQS! Yes I know I’m lame. But I will share the judges comments with you, privately of course; soon as I have time to scan them into the ‘puter.